We will participate in INDIA ITME2016, to be held in Mumbai, INDIA, Dec., 3-8, 2016. 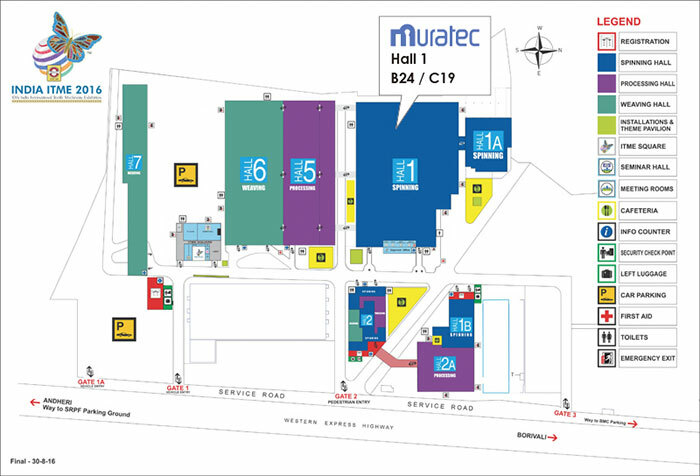 | Corporate Profile | MURATEC,MURATA MACHINERY, LTD.
We will participate in INDIA ITME2016, to be held in Mumbai, INDIA, Dec., 3-8, 2016. We will participate in INDIA ITME2016 (the 10th India International Textile Machinery Exhibition), to be held in Bombay Convention & Exhibition Center, Mumbai, INDIA, Dec., 3-8, 2016. We are located at booth number B24/C19 in Hall 1. We’re looking forward to seeing you at our booth!